I am passing the reigns over for today’s post to the S-club: Sinbad and Sandy to give their review of Tigerino cat litter we were sent to test from Zooplus UK. As I’m sure you know – cat litter isn’t elegant (or is it?) but it is a necessity especially for house kitties like our two and there are so many options and such a range in prices – is it possible to get a cat litter that delivers the goods while also being light on the wallet? As 2 house cats we spend a lot of time in the bathroom! We usually use non-clumping clay litter. Natalya wasted money on ecofriendly wood chippings once – we just hated them! So trialling a new cat litter with us could have been a potential disaster. We’re cats, we’re fussy and we know it! But when Zooplus got on twitter asking for reviews our human mum jumped in and we put the cat litter to the test! We ran the comparison for two weeks to check the claims made by the cat litter that it could last 15-20 days for 2 cats. We were prepared and up for the job! Firstly the sensation – it certainly is much softer on our paws – fine like grains of sand and we definitely didn’t have problems with it getting in our paws like our normal cat litter (which is a bonus as we don’t like carrying it around the flat and we know Natalya hates hoovering as much as we hate the Hoover). It was a nice blue colour too (from natural food colouring) which was a nice touch! During the first week we weren’t sure – but we started using it and have never looked back! The sand-y ( 🙂 ) grains don’t clump up and makes it easy for a quick daily clean. After the first week the familiar ammonia smell started to rise from our clay cat litter despite daily cleaning and it was time to throw it away, clean the tray with vinegar and refresh. But…the blue litter kept going. We had a laugh at human mum as she sniffed our litter – we can confirm she didn’t pass out! The litter had some discolouration on it – likely from chemical reactions caused by our ablutions (yep – we like science – we watch a lot of programs on YouTube) but it didn’t seem to impact on the efficiency of the litter in keeping everything smelling fresh. Even after 2 weeks when we changed the litter we didn’t have the usual problems of it all clumping into a solid on the base of the tray and human mum had it clean and back in action for us in no time! In a recent blog post human mum wrote about wanting to be more organic and ecofriendly. What we didn’t realise (because we can’t read good) is that this litter can actually be thrown on the compost heap rather than having to be thrown away in the bin. This is great for the environment and really unexpected from these silicate crystals which we always thought were more environmentally unfriendly than the clay litters. We need 1 8L bag per week of Sanicat for 2 trays but we would need almost 2 5L bags per fortnight of Tigerino for 2 trays. This is a saving of roughly £17.16 per year! This is one of those classic cases where paying a little more on cost price can actually help save money in the long run! Cost: 8/10 – cheaper than our current litter but actually this litter would be a better bargain (while offer lasts) : 20l Tigerino Crystals Silicate Litter + 10l Free! Practical-ness: 9/10 – quick and easy to use, no large clumps in paws or on the soles of feet and scuffed over carpets and easy to scoop and clean, although there are tiny little grains around the litter box. No ammonia smell even after 2 weeks with 2 cats (and 2 trays with daily emptying). Really handy it lasts 2 weeks for 2 cats. Eco credentials: 7/10 – great that it can be disposed on a compost heap! and uses food colouring rather than harsh chemicals but how ecofriendly is the silicate production? Note from Natalya – I was sent these items to test for free but the review is a completely honest representation of the kitties opinions (as far as they let me know!) – I received no fees for writing the review. 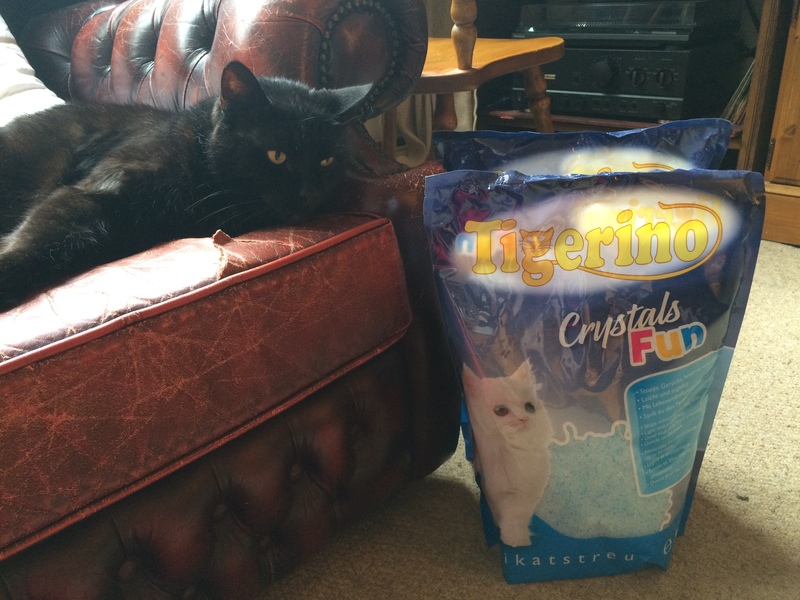 We reviewed the Tigerino Crystals Fun Coloured Cat Litter 5 litre bags in blue from Zooplus UK. This entry was posted in Cats, guest blog, New Products, Products in Focus, review, zooplus and tagged cat litter, Cats, guest blog, litter, product test, review by katieh. Bookmark the permalink.